I like to read on my iPhone / Kindle at night before bed. I usually stick to technical books and science related stuff, so I often find myself highlighting important ideas so that I can review them again and again. This is something that iBooks and Kindle have built-in. Recently I read a really great article by Sophia Voychehovski on Object Oriented UX Design. It was full of so many great insights that I wanted to save them for later review like I do with reading apps. I checked out the Chrome store but didn’t find anything immediately. I’ve used Evernote in the past, but wanted something super simple and thought it’d be fun to look into the Chrome Extension APIs. I put together Quoter pretty quickly. The Chrome APIs are cool and pretty intuitive. There is a storage API that syncs the data between user’s devices. If I save a quote on my laptop, it is automatically available on my desktop. Programmatically it’s basically just like using local storage except that the data is returned asynchronously in a callback. 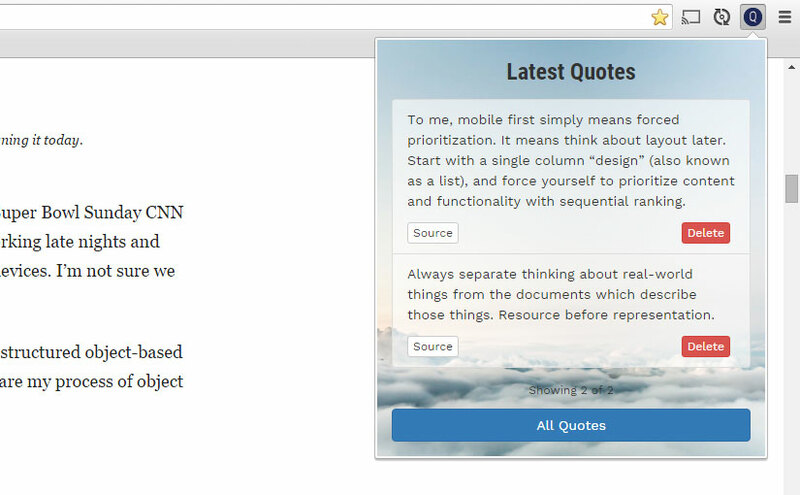 The extension is super simple; it lets you save quotes from web pages for later review. It keeps track of the site the quote is from so you can revisit it again. I’d like to add a few more features and build it out more if I can make the time to do so.